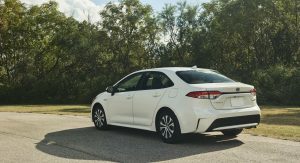 Toyota rolled out the all-new Corolla in hatchback form earlier this year, and followed up with the European wagon version in Paris, and the sedan version at the Guangzhou show in China just a couple of weeks ago. 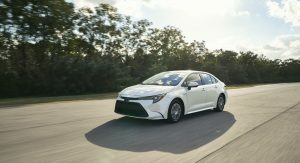 Now it’s brought the new Corolla sedan to North America for its debut at the LA Auto Show, and revealed full details of its hybrid powertrain in the process. 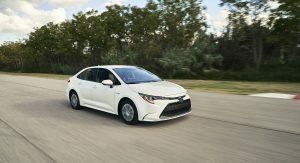 The system delivers a combined output of 121 horsepower (90 kW) and fuel economy projected at upwards of 50 miles per gallon. 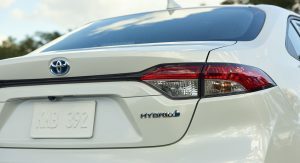 It also employs a new Hyper-Prime Nickel battery that sits flat under the rear seats (instead of the trunk) for a lower center of gravity and better packaging in the TNGA platform. 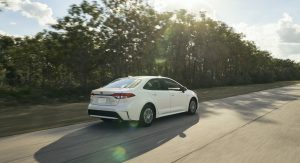 As you might expect, the Corolla Hybrid will feature both Normal and Eco driving modes, as well as an EV mode for pure electric motivation over short distances. But it also offers a Sport mode that increases the amount of power available for acceleration. 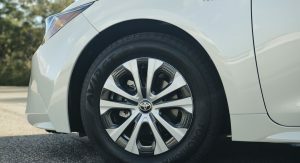 And the regenerative braking system is designed to work with the shoes in the wheels to offer more stopping power. 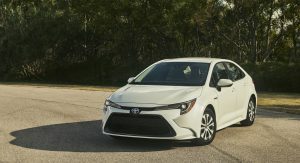 The Corolla Hybrid rides on its own set of 15-inch alloys with low-rolling resistance tires, and offers all the safety and infotainment technologies you’d expect from a major automaker’s latest product. 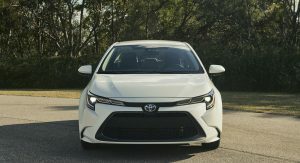 Pricing has yet to be announced for the US market, but you can expect to pay a premium for the Corolla Hybrid over the conventional version as it joins Toyota’s growing gasoline-electric lineup alongside the Prius, Prius Prime, Prius C, the Mirai fuel-cell vehicle, and hybrid versions of the Camry, Avalon, RAV4, and Highlander. I like the Chinese version better. But this is still good. Maybe cannabalizing on Prius sales, no? 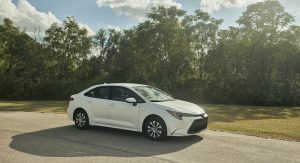 Prius on the chopping block? 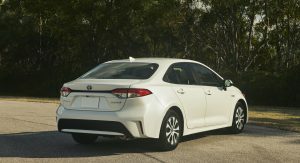 Only so many small sedan sales to go around. 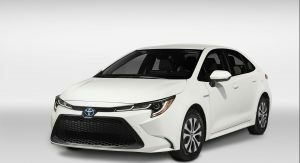 with Prius sales plummeting, it makes sense to axe the base Prius but keep the Prius Prime Plugin, until they introduce the Corolla PHEV. 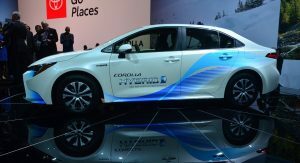 I believe the Prius has always been a loss leader anyway. 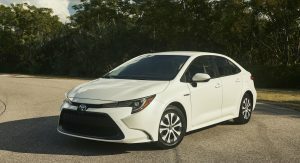 Can Toyota do something about it not looking like a big mouth bass? 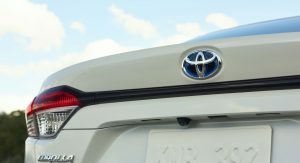 I don’t think that Toyota is able to design cars without a big plastic maw. What people should understand is that 50 mpg from a nickel battery on this type of car is pretty impressive. 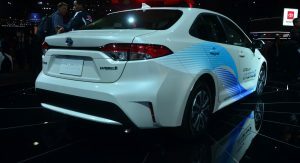 The Insight might still beat this when it comes to overall fuel economy numbers, but that car employs a lithium-ion battery. 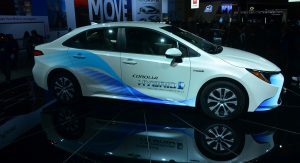 While lithium ion batteries overall are more fuel efficient due to holding a greater amount of charge per their size and being lighter, they haven’t proven to be better for long term reliability. 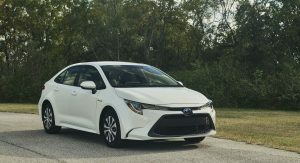 Lithium ion batteries degrade faster overtime than nickel batteries, so while the Insight might not hold the same mpg rating 3-4 years from now the Corolla will hold it’s rating for years and years to come. Aren’t most car batteries nickel? They only last about seven years. Most lithium EV/Hybrid batteries maintain 80% of their capacity over 300,000 miles because they have elaborate battery management systems. And I’m going to need a source on that 80%. This is the ‘Prius’ I would buy. Toyota/Lexus are the worst offenders though. Uh, no. Mitsubishi? BMW’s new hamster buck teeth grille? 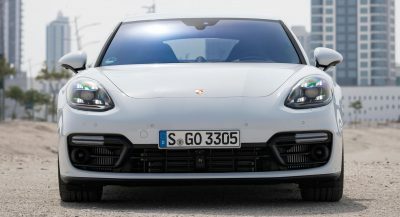 There are so many worse grilles. 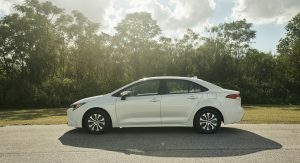 I mean I can agree with Toyota on the Avalon. So, wait a minute. 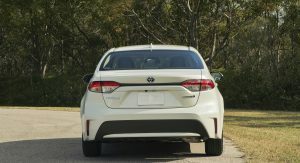 Not only did they put the Prius powertrain in the Corolla hybrid, but they smartened up the front end and got rid of the gimmicky C-pillar/deck lid character lines? 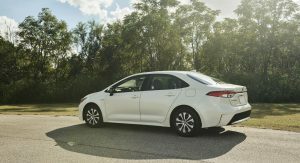 I mean, sure, it’s kind of back to “Honey, I shrunk the Camry,” but with the current-gen Camry, that’s hardly a bad thing. 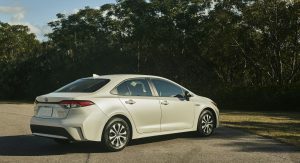 Bring a hybrid estate to the U.S. with that look and I’m in. People are just sensitive, that’s all. The Prius is now dead. Yes but you have to remember to that lithium loses 50% of its capacity in cold weather conditions. The same can’t be said of nickel hydride batteries. And nickel batteries are cheaper to replace when they do need replaced. 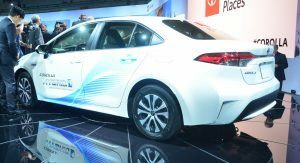 A nickel hybrid battery will cost you $2000-2500 while lithium will cost you $4000 at least.